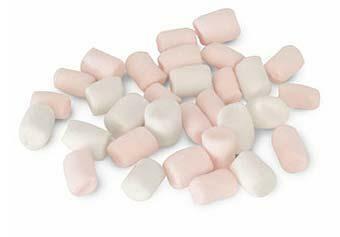 Pink & white marshmallow are soft, chewy, spongy and light. They are uncoated. Product description: chewy, coloured, fluffy, palm oil free, rocky road, soft, spongy. Suitable for: bakery, beverages, chilled & frozen desserts, chocolate, confectionery, gluten free, home baking, ice cream, nut free, snacks & bars.